Jesus was in the city of Ephraim, in hiding since the Jewish authorities desired to kill him. On this day (before evening), Jesus and his disciples went up to Jerusalem, before the pasch to purify themselves (John 11:55). They spent the night in Bethany, which is very close to Jerusalem. The pasch (i.e. Passover) was on a Thursday that year (beginning Thursday eve with the Passover Meal), and so six days before, that is, on Friday, Jesus came to Bethany. The next day, which is to say, Saturday, Jesus came to the feast there and was anointed by Mary of Bethany (that is, Mary Magdalene [here]). In this first anointing, Mary pours the oil over the Savior’s feet. This meal and anointing occurred, most probably, at the house of Lazarus known as the Lazarium. Our Savior spent the night in Bethany. Our Lord returned to Bethany for the night. On the way into Jerusalem, Jesus sees a fig tree which has born no fruit – which tree he curses in the presence of his disciples. Upon entering the city, our Lord goes up and cleanses the Temple for the second time (he had cleansed it once already, two years ago – cf. John 2:13ff [see our article, here]). That eve, Jesus returned to Bethany (cf. Mark 11:19). On the way to Jerusalem, Jesus’ disciples notice that the fig tree which he had cursed the morning before has now withered. They are amazed. Entering the Temple area, Jesus preaches extensively and answers the questions of the Pharisees and Sadducees. It is on this day that our Lord tells the parable of the vineyard workers who kill the owner’s son who is the heir to the vineyard. Also, on this occasion, the Lord answers the questions regarding the tribute to Caesar, the resurrection of the body, the greatest commandment, and whether the Christ will be the son of David. Further, while in the Temple, our Lord sees a widow offer two small coins and declares her gift to be greater than those of the others. Finally, Jesus foretells the destruction of the Temple and speaks of the final judgment. He returns that night to Bethany. Spending the day in retirement, our Lord attends a feast at the house of a certain Pharisee, Simon the Leper. During this meal, Mary of Bethany (i.e. the Magdalene [here]) again anoints our Lord, but this time upon his head. Update: I am aware of the fact that there is a good deal of diversity among the Church Fathers on whether Mary anointed Jesus on Spy Wednesday. I side partially with Origen, Chrysostom, and Theophylus (against Augustine and Gregory) in affirming that there were two anointings, one on Saturday and another on Wednesday; but then agree with Augustine and Gregory (against Origen and Chrysostom) insofar as I claim that there was one and the same woman, Mary of Bethany who is the Magdalene. St. Thomas Aquinas did not come down on one side or the other of the question, so there is clearly room for doubt. Update II: As I consider this further, I am beginning to lean more toward the side of Sts. Augustine and Gregory. Perhaps there was only one anointing (which would then be on Saturday) and Sts. Matthew and Mark mention it here as a way of connecting the betrayal of Judas more clearly with the incident. Because it was this evening that Judas conspired against Jesus, the day is called “Spy Wednesday”. Because the Passover meal would be consumed Thursday evening, Jesus sent his disciples to make the preparations for the pasch. They went from Bethany to Jerusalem and prepared the upper room. On this evening, Jesus offered the Last Supper in which he instituted both the Eucharist and the Priesthood. Upon finishing the meal, our Lord and his apostles (excepting Judas, who left early) sang a hymn and then went forth to the Mount of Olives. On this night, our Lord suffered the agony in the garden and was arrested. Jesus spends the night locked in the dungeon of the house of Caiaphas, after undergoing a secret night-trial by the Sanhedrin. It was on Friday that our Lord suffered and died. Condemned to death at 10am, nailed to the Cross at noon, and dying at 3pm. Christ was buried before 5pm and, the stone being rolled across the entrance, all departed. N.B. A much more detailed chronology of the Triduum will be posted during Holy Week. Also...We all know that the Last Supper took place on Holy Thursday. But if it was evening, according to Jewish understanding of time it was already Friday. We can relate the words on the Cross: "It is finished. ", with that fact that the "real thing" started early on Friday(i.e. Thursday evening according to our time measuring) and that it was finished in the late hours of Friday(6th hour) - is this reasoning correct. I have never been convinced by all this business of the "Essenes" influencing Jesus and the Apostles ... even though I know that Pope Benedict XVI once mentioned it in a homily. There are just so many dramatic theological differences ... after all the Essene way was focused extensively on ritual purity -- radically contrary to both John the Baptist and our Savior. And there is much more to be said besides. Probably the better way to explain it is that the "solemn Sabbath" to which St. John refers (and which some mistakenly interpret as Passover) is the Sabbath within the octave of Passover (which was on Thursday/Friday). I have switched to embedded comments, since some said that this will make it easier to "subscribe by email." Yet the discrepancy favors John as saying that Jesus died on the first day of Azymes - otherwise the entire logic of showing Christ as the new Lamb would be lacking. Sincerely, I can come to two (and only two) possible harmonizations. 1) Jesus' trial lasted more then expected. If the Jews really wanted to kill him before Passover, while did they delay the arrest for two days after Christ's last discourse in the Temple (Holy Monday)? There are some good texts that show that the one of the Synoptics portrays two discourses early in the morning as if they were two distinct mornings. I'm sorry I can't recollect exactly the quotes - If I find them, I will post them as soon as possible. What may confirm this possibility is the fact that the early churches practiced abstinence on Wednesdays and Fridays alike. 2) There's also the possibility that the Jews had it wrong in computing the Passover. At the time, the beginning of the month was marked by eyesight of the new moon. But in case of bad weather conditions, direct observation of the moon phases may have been delayed even by one whole day. So, if Jesus as Creator had calculated the right date while the Jews had observed the new moon one day later due to bad weather conditions, we should look for a year when Passover may fall on Tuesday rather then Friday. Jesus celebrated correctly according to the moon phases, while the Jews celebrated on day later, since they couldn't observe the new moon in time to begin Nisan on the right day. 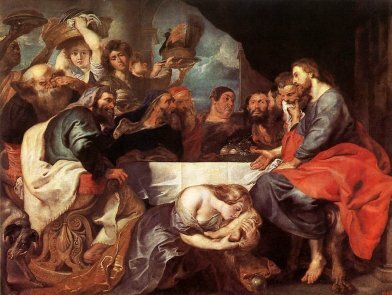 On both occasions, the validity of Christ's Last Supper as a Passover meal is saved, as well as the truth that the priests were sacrificing the lambs on Friday morning (1st day of Azymes). What really matters is that we must defend the accuracy of the Gospels... this is fundamental for Catholics in the present day. Thank you very much, this timeline is so helpful: it is the kind of device that helps us laymen to organize our thoughts as we set to pray and meditate on the mysteries of the life of Christ, esp the days leading up to His Passion. Maybe I was just a bad student, (or maybe my memory's going) but I can't ever remember such a clear and well-documented chronology being taught. God bless you, Father. Mark's gospel has Jesus being crucified (maybe led out to Crucifixion?) at mid-morning (9a.m.?) and the sky becoming dark at noon, with Jesus dying about 3 p.m. In that narrative He may have been dying on the cross for closer to five hours than three. OTOH, Luke has Pilate sending Jesus to Herod after learning that He is a Galilean. The Sanhedrin condemned Him to death at daybreak, and had to seek audience with Pilate after that. Many events have to fit into the morning of Good Friday: Sanhedrin condemning, first meeting with Pilate, visit to Herod, second meeting with Pilate, scourging, crowning with thorns, mocking, Via Dolorosa, and crucifixion. @TeaPot ... I will cover more on this in a post mid-week. I am presently reading Jesus of Nazareth by our Holy Father, Jesus of Nazareth II. He also deals with the topic at hand. He seems to believe in a different chronology of those events. Below, I took the liberty of pasting a link of that section pertaining to those chronologies. 3) The earliest witness of Patristic Tradition in support of either chronology. Hope this helps to study the matter in depth. I am not surprised to hear that Pope Benedict would present a different chronology ... he is far more influenced by modern historical-critical protestants, than by the Fathers of the Church and the Catholic exegetes of the scholastic and counter-reformation periods. The Reverend Kenneth L. Smith Sr. Thank you for your thoroughness in this subject. God Bless and Keep You!